When you make the decision to upgrade your home with hardwood flooring you are increasing your home’s value and adding a natural beauty to your home. 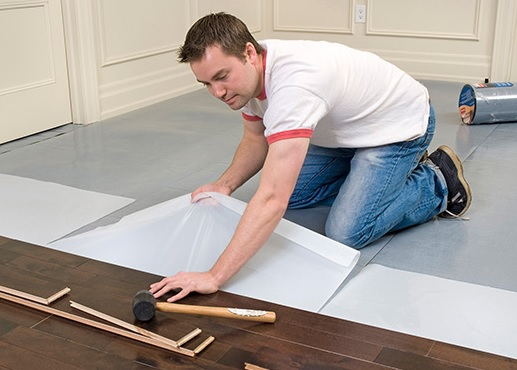 Once installing hardwood floors there are important things that homeowners need to know when it comes to moisture and how it can affect your valuable investment. One main thing to consider is that the wood on your floor will experience a seasonal movement. There are specific conditions that your floor will encounter with these changes in seasonal movement. One option to avoid the effects of moisture on hardwood floors is to look into an alternative to hardwood floors that is less demanding to maintain known as laminate flooring. Whatever your decision is for your home hardwood flooring, you can be sure that adding this natural effect to your home will create a welcoming, luxury ambiance. The experts at our Chicago Hardwood Floor Installation Center can help you understand the seasonal movement of wood flooring and how it responds to variations in humidity throughout the seasons by expanding and contracting. Though the wood is put through the process of being dried and cut before installation, these weather impacts on the wood are inevitable. During the warmer summer months where the weather is more humid, the wood on the floor will expand. When the cooler winter weather comes there is less humidity in the air, thus the wood contracts. Because this a normal process for the wood, the only way to control this movement is to install humidity controls in rooms where wood flooring is installed and make sure the controls are fully functioning before installing the hardwood floors. While wood floors should last the lifetime of the home, moisture is one of the biggest enemies of homeowners enjoying this prestigious upgrade. One common thing to watch for as humidity levels change within the environment are cracks in the flooring. Certain types of flooring will show the cracks more than others, but these cracks usually close up as moisture is released back into the air and the wood expands. Cupping and crowning are other natural reactions that occur with moisture contact to the hardwood floor. Cupping is when the edges of the boards are higher than the center of the board and usually happens after water is spilled on the floor and has been absorbed into the wood. Crowning is the opposite of cupping. With crowning, the middle of the board rises up above the edges and occurs when the floor encounters moisture as well. Buckling is another extreme reaction that moisture can cause to hardwood floors. Though this usually only happens when the floor is flooded, this effect can be repaired. Laminate flooring is an alternative to hardwood flooring that has some benefits that make it a desirable option for homeowners. It gives a similar appearance and is easier to install and it does not experience the same negative impacts of humidity as natural hardwood flooring encounters. 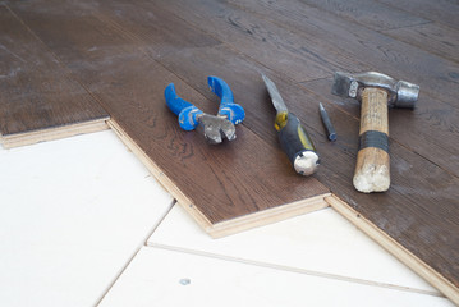 Our experienced Chicago Floor Installation company can help you understand the distinct differences from these two types of flooring and how they affect your home’s value, the maintenance required to preserve their appearance, and provide answers to all of your flooring comparison questions. While both types of flooring are durable, there are certain components that make each one desirable over the other and contacting our experienced professionals can help you to make the best choice to fit your home needs. Classic Floor Chicago is a professional flooring company that has been providing quality services to satisfied customers for over 16 years in the Chicago land area. Their large selection of hardwood floor services makes them your one-stop choice for all of your hardwood flooring needs in your home. Our experienced professionals are reliable and respectful and operate the only state of the art equipment with competitive prices that greatly supersede their competitors. Check our website out to get an idea of the wide variety of options available through our esteemed company and view our great customer reviews. Call today to schedule a free estimate and let us provide all of your hardwood flooring needs. Laminate Flooring Restoration – Bring your Home Back!